Facebook and Twitter profile images and cover photo artwork. 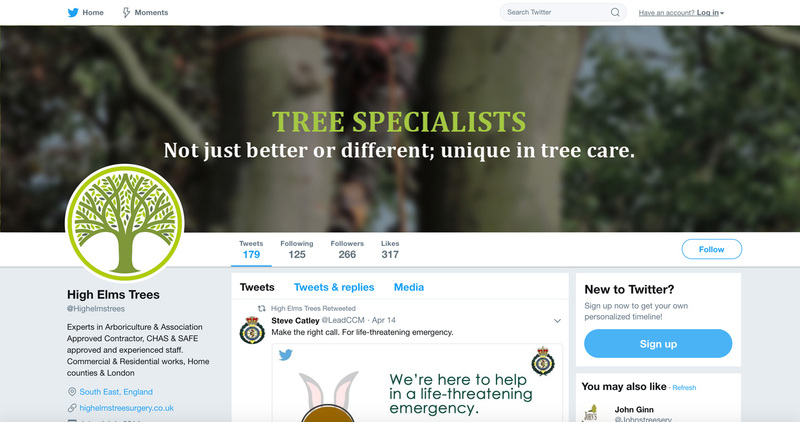 High Elms Tree Surgery Ltd is based in Harpenden and needed help creating eye catching cover images for their social media platforms to match their new website design. It’s important to keep brand consistency across your social media channels and you can do this by creating professional graphics for things like Facebook and Twitter cover photos. I used the social media design service I offer to create professional channel artwork for of each High Elms Tree Surgery’s social media platforms. I designed cover photos for both channels, making sure the correct size canvas was used so that they worked on both mobile and desktop devices. I carried over the images and branding style from the new website to make sure that everything remained consistent. "These graphics put the finishing touch to our new identity, they look great too!"